The Carotid Head Simulator is to be used with the Carotid Artery with Plaque for the acquisition, practice and retention of vascular surgery carotid endarterectomy skills. Skills: Realistic human head with neck opening at the proper angle allows trainees to access and remove plaque and suturing at bifurcation. Pulsatile pump is available and useful to evaluate the quality of the repair. 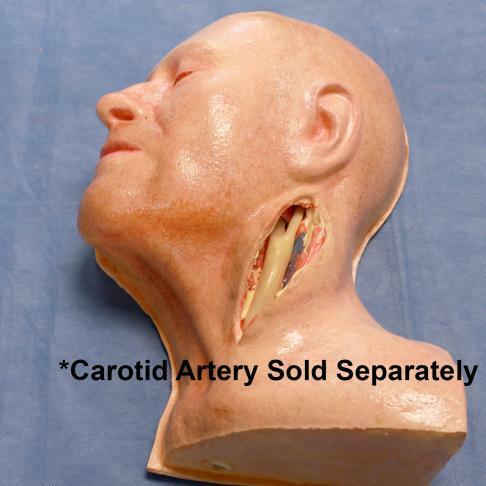 Options: The Carotid Head Simulator consists of a male size head with an opening at the neck where a Carotid Artery with Plaque can be placed to provide a very realistic scenario. The Carotid Head Simulator is available with, or without a pump. This simulator contains latex. Latex based male size head with opening at the neck for the placement of the Carotid Artery. The carotid head weights 350 grams and it is 29 cm X 20 cm x 9 cm. Manufacturer – LifeLike BioTissue, Items 1205, 1219.